The walkers gathered at the village green at Healaugh, where Cliff's bacon & sausage butties were thoroughly enjoyed. The route took them through the village and immediately up Calver Hill with excellent views over Swaledale. At the top they followed the path dropping down into Arkengarthdale to go through the small village of Arkle Town and then following the lower route below Fremington Edge all the way along to High Fremington. 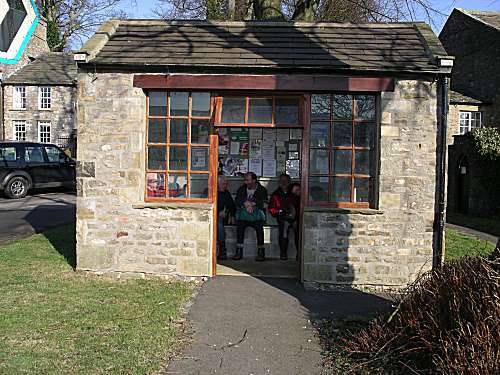 The walkers take advantage of a very posh bus shelter at Low Fremington, to consume their sandwiches, before walking the short distance along the road to cross the river at Grinton and stop for welcome pints of Jennings Cumberland Ale at the Bridge Inn. The walkers again consumed far too much Jennings Ale, but all agreed that this was one of their most memorable lunchtime stops. The journey back to Healaugh followed the river for most of the route, where the walkers, including Moss, stopped for a photo call on the Stepping Stones, close to the end of their walk. 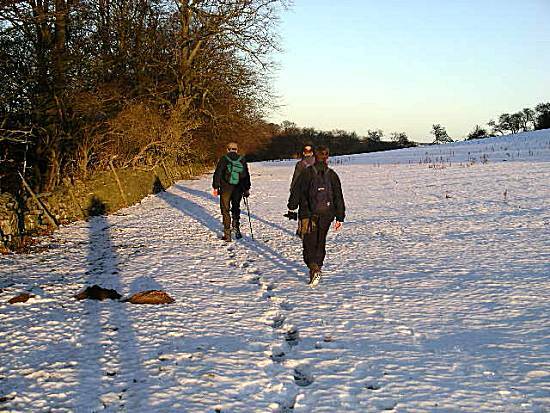 Weather: Very cold and hard underfoot until the sun softened the ground. An excellent walking day. The walkers met at the roadside close to Kilgram Grange near Jervaulx Abbey, where after enjoying Ron's superb Bacon & Sausage Butties they set off, quickly losing their way to Ellingstring village. After a small detour involving crossing a couple of barbed wire fences, the correct route was re-established. After Ellingstring they joined a long straight track slowly climbing up through Witton and Braithwaite Moors to a height of some 1200ft, where some snow was encountered. The pathway then dropped steeply down to into Coverdale, passing Braithwaite Hall (National Trust) to cross the River Cover at Hullo Bridge. The familiar route along the riverside took the walkers directly to the Coverbridge Inn, where 4 pints of Timothy Taylors and Black Sheep ales were consumed. 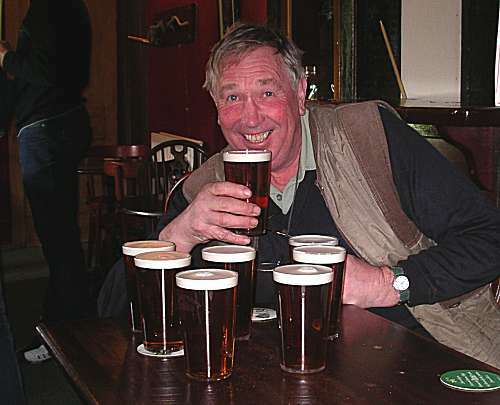 Portions of chips were ordered to complement the ale. After leaving the lunchtime stop, the route back to the cars took the walkers along the river to enter the Jervaulx Abbey grounds and onwards back to Kilgram Grange. Weather: Cold in the wind, but some sunshine made a very pleasant walking day. A start point on the roadside at Summerbridge had been selected by Neil, where the walkers gathered to consume Bacon & Sausage Butties, before setting off through the town. Shortly after crossing the River Nidd at Dacre Banks they joined the Nidderdale Way for a relentless uphill section, with a biting headwind, towards the Heyshaw television transmitting mast. 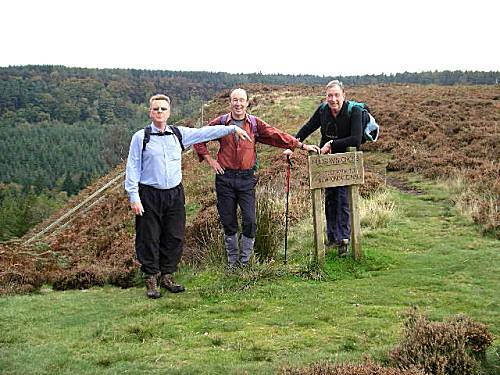 Later the walkers stopped to marvel at the ruin of "Yorke's Folly", before dropping down to pass close to Pateley Bridge. Remaining on the Nidderdale Way the route then continued upwards towards Hillend, where shortly afterwards the group stopped for well earned portions of Pork Pie, having watched a newly born lamp struggle to get to its feet for the first time. 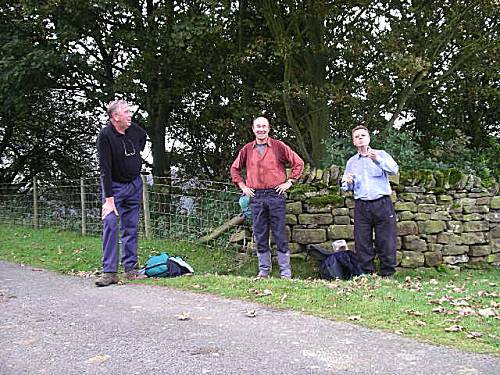 The route took the walkers through an old mining area, where afterwards they followed the Ashfold Side Beck back to the River Nidd. 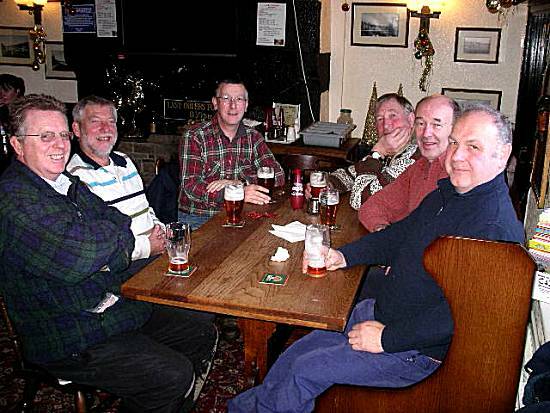 The Nidderdale Way took the thirsty walkers back towards Pateley Bridge where they felt compelled to visit The Royal Oak. Sitting outside in the sunshine, they consumed 4 pints of ale each and 3 portions of chips. Much refreshed the group set off to cross the river at Pateley Bridge and follow it back to Summerbridge, stopping briefly to feed the ducks at a riverside lake near to Glasshouses. Weather: A cloudy start with a strong wind, turning into a warm sunny afternoon. 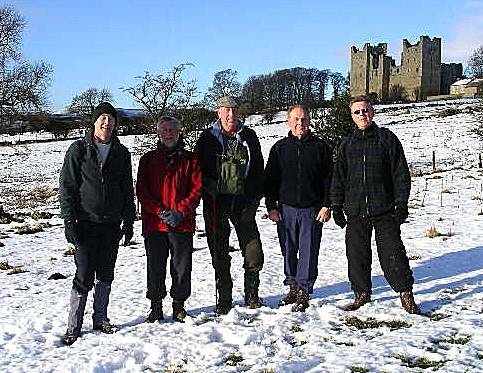 The walkers met at a layby just south of North Stainley, enjoying Ron's Bacon & Sausage butties before setting off through North Stainley following the river along to West Tanfield where a detour was made to investigate the ancient Marmion Tower. Afterwards continuing to follow the route of the River Ure, on the Ripon Rowel footpath, passing through the village of Mickley, before the walkers headed into Hack Fall Woods. Here they stopped in a small roofless round building with a strange cement finish for portions of Neil's Pork Pie and Alan's chocolate crispies. 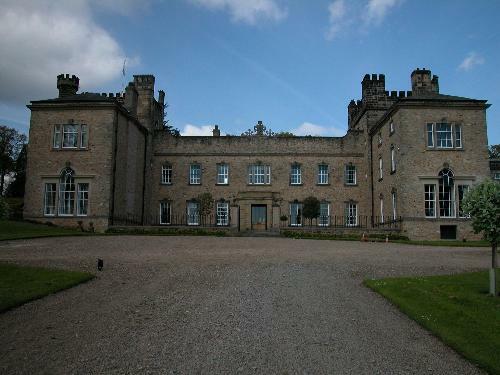 The route then took them up steeply through Hack Fall Woods past a waterfall to get to the recently refurbished folly at the top with excellent views over the countryside towards the Hambleton Hills, where they were observed admiring the view. 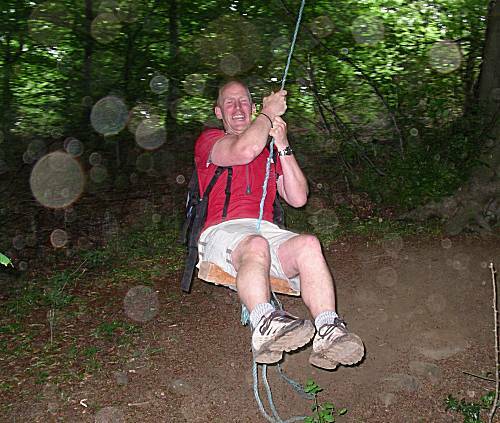 The walkers continued through a forest section before taking a footpath back to Grewelthorpe where they stopped in the Crown Inn for quantities of Jennings Cumberland Ale and two portions of chips. After the welcome lunchtime break the walkers headed back towards the river to retrace their footsteps through to Mickley taking a direct route to North Stainley and back to the cars. Weather: Warm but cloudy, getting better during the afternoon. 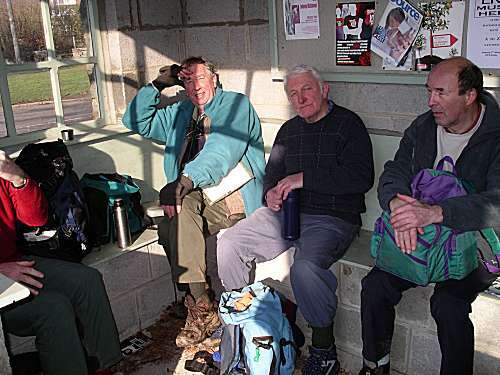 The only three walkers who could make it, met in Ripley car park at 8-30. After enjoyable bacon and sausage butties, they set off through the village heading north on route for Brimham Rocks. Passing through the village of Shaw Mills on the Nidderdale Way the route took them up and across Brimham Moor to reach the rocks where they enjoyed the their first instalment of pork pie. Following indistinct paths they worked their way down to cross the main Pateley Bridge road at New York. Following a path close to the river the walkers stopped briefly by the river to finish the pork pie, before continuing to Dacre Banks, where a lunch stop was made at the Royal Oak. The walkers felt the need to share two portions of chips, which were considered a good complement to their London Pride Ale. 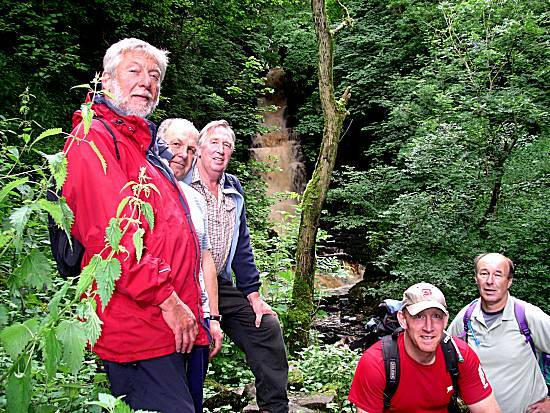 After lunch the walkers followed along the bank of the River Nidd for some distance, but at a bridge the route of the Nidderdale Way became unclear. After some discussion they continued on their way, but had to negotiate a wall or two to get back on route. 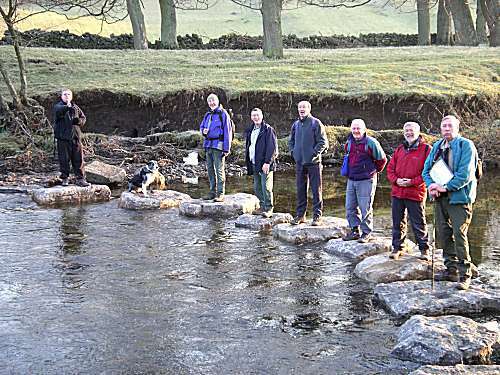 They walked through Birstwith to cross the river at Hampsthwaite, before Ripley Castle came into sight. Although Ron had to leave immediately for evening duties at Newby Hall, Neil and Alan found time to try a Ripley's famous ice-cream before returning to the car. Weather: Warm and sunny most of the day, but with a number of showers. The walkers met at Cliff's house and enjoyed his delicious bacon & sausage butties, before posing for the group photo and setting off through the village. After the falls the route took them up going through the village of Carperby, before Cliff realised that he had forgotten to bring his map! The walkers then headed steeply upward to pass by an impressive transmitting station and mast before dropping down for a break by a fast running stream at Hazel Bank. The route then followed along the north side of the dale with magnificent views towards Hawes. 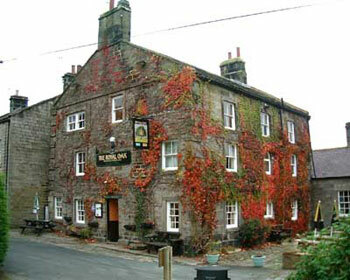 The Crown Inn at Askrigg had been selected as the lunch time stopping point, however, Cliff passed many signs to Askrigg in search of the Mill Gill waterfall, which he had not previously visited. After a welcome stop at the Crown Inn in Askrigg (with chips), the walkers continued to head uphill passing through Worton and Thorton Rust on their journey to climb over from Wensleydale down into Bishopdale towards their destination at Thoralby. Cliff took the walkers further along the dale to a bridge, as he knew that it would have been impossible to cross the swollen stream using a direct route. 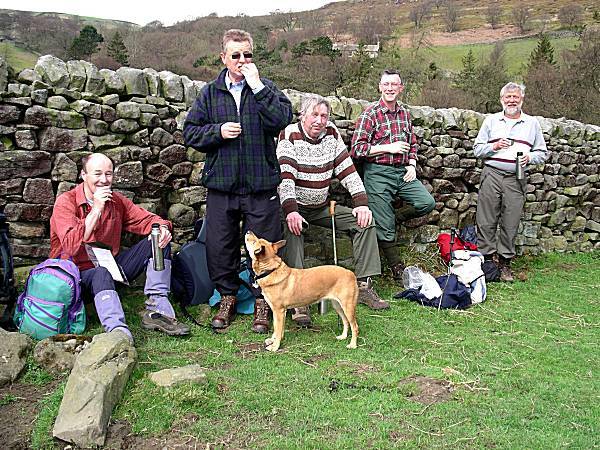 After dropping steeply into Thoralby the walkers arrived at their destination and all agreed that it had been a splendid, but challenging walk. Weather: Warm and dry all day, despite threatened showers. 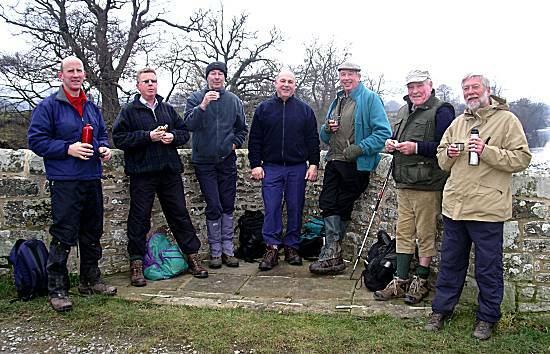 The group gathered opposite the Navigation Inn in Ripon to enjoy nourishing Bacon Butties courtesy of Ron. 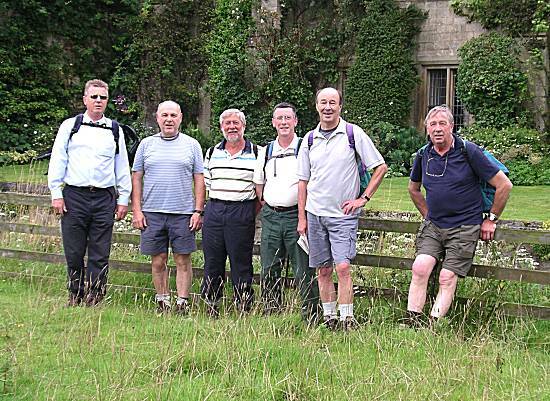 The walkers set off passing the "Water Rat" to follow the River Skell out of Ripon past Whitcliffe Hall towards the Markenfield, where they stopped for a group photo outside the magnificent moated Markenfield Hall. The route took the walkers on to Markington, where this time they did not miss the footpath taking them to South Stainley. Here they stopped on a small bridge to enjoy their sandwiches and share Alan's chocolate crispies specially prepared the night before for the benefit of Cliff, who consumed three. The route took the walkers onward to Burton Leonard where another stop was made for a group photo before the walkers called at the Hare & Hounds for a couple of pints of their excellent Timothy Tailors Landlord ale. The walkers, sitting outside in the sunshine, found it necessary to sample a bowl of chips which were considered to be of an excellent quality. After a further 2 miles the walkers voted to call briefly at the Masons Arms in Bishop Monkton for a quantities of Theakstons XB ale. 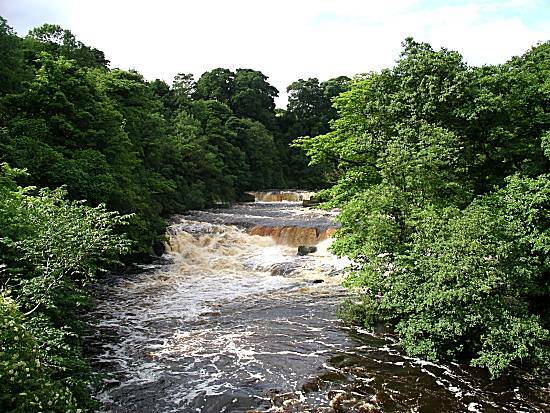 The Ripon Rowel route then took them towards the River Ure, which was followed until the Ripon Canal started. The canal section took the walkers past Ripon Racecourse where they stopped to observe the start of a race, before reaching Ripon town at the end of their walk. Further ale at "The Water Rat" was declined and they departed after what was deemed to be another enjoyable and successful walk. 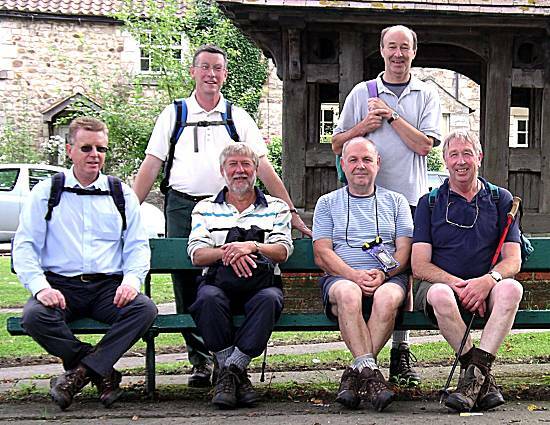 Walkers: Neil (Leader), Alan, Ron, Cliff, Paul (limping) & Andy. Some difficulty was encountered in locating parking spaces at Pickering due to the increasing popularity of the Wartime Weekend. We thoroughly enjoyed Cliff's excellent Bacon and Sausage butties before setting off earlier than normal at 8-25am. 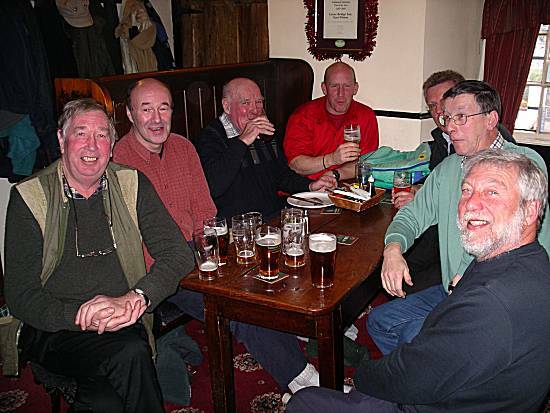 A good pace enabled us to enjoy 5 pints of Black Sheep ale in the Birch Hall Inn with good banter. Left around 3:45 for the final section of the walk to Grosmont to catch the 16:45 back to Pickering. Arrived back in Pickering around 18-00. 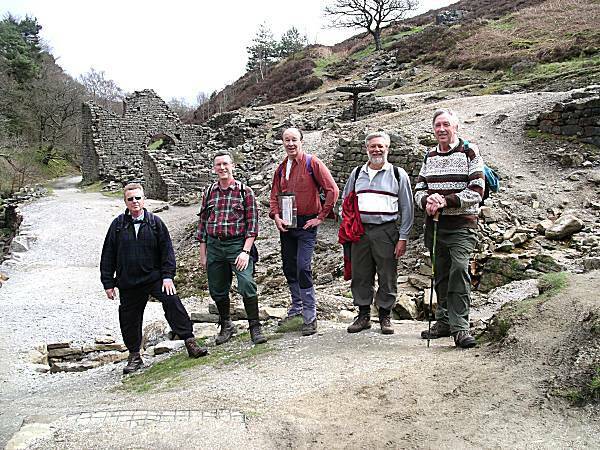 Arrived at the Richmond car park to enjoy Ron's Bacon Butties before setting off up the steep pathway. Crossed the old racecourse and golf course, passing Aske Hall before a welcome Pork Pie stop. Continued along the track to Ravensworth, arriving before 12 o-clock, so a quick sandwich stop was made at a seat around a tree on the pleasant village green. 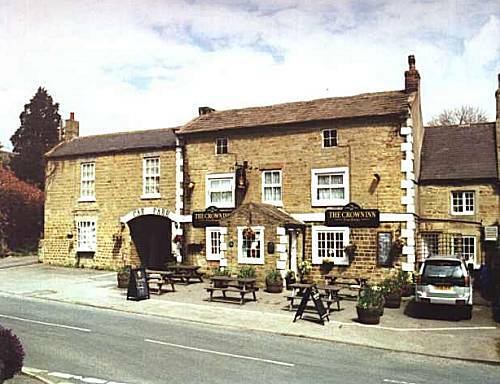 Arrived at "The Bay Horse" in Ravensworth where a number of pints of an unusual, but pleasant guest ale were enjoyed. Afterwards headed back, passing Kirby Hill, before taking a slightly different route back towards Richmond, arriving at the old racecourse and following the steep pathway down to the cars. Weather: Damp and drizzle at times and incredibly wet under foot. The walkers arrived at Wensley around 8-30, parking close to the river bridge and after devouring Cliff's bacon & Sausage butties, set off along a slippery track to Bolton Hall. They continued on a forest track all the way to reach Redmire, whilst listening to the distant gunfire from the Army firing ranges. Leaving Bolton Castle they travelled onward through West Bolton to eventually reach Carperby, turning south to head down to Aysgarth Falls, which were in full flow. 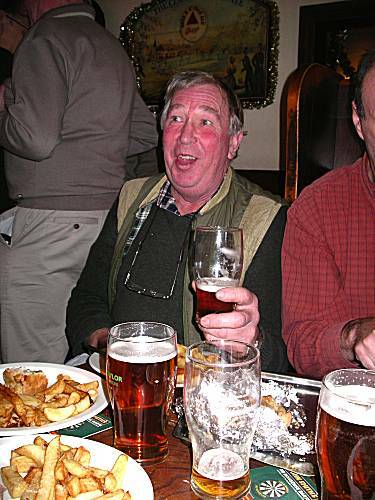 Paul was waiting, as they past his house, and joined them for the walk across the fields to the Fox & Hounds in West Burton, where refreshing ales and small portions of chips were enjoyed in excellent surroundings. Slighty departing from the designated route the walkers had to scale a wall to get back onto the road into West Witton. At the far end of the village they took a path down to Lords Bridge and afterwards following the south side of the river to Wensley Bridge arriving in the dark. All agreed that it was an excellent walk. The walkers arrived at the now familiar small grass verge just south of Leyburn, enjoying Ron's Bacon and Sausage Butties, before setting off towards Leyburn in very cold conditions. Walking through Leyburn they joined the "Leyburn Shawl" footpath, eventually reaching Preston-under-Scar, where they turned passing Bolton Hall to stop at Lords Bridge. 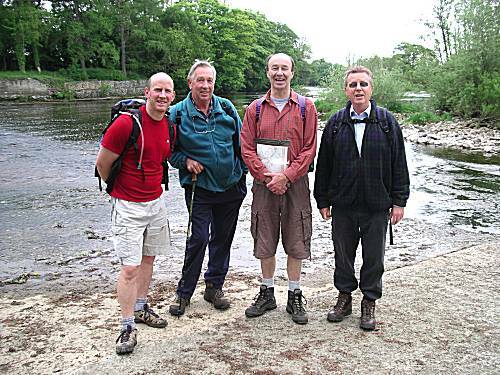 Here they observed the very calm River Ure whilst taking some refreshments, including Alan's mars bar crispies. 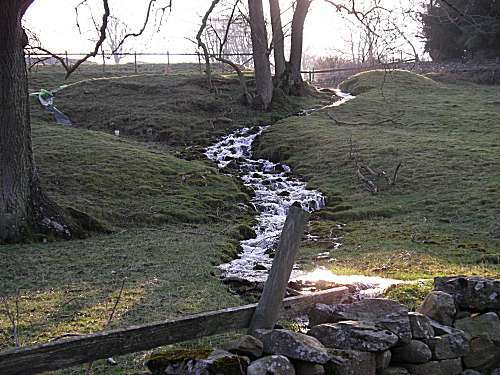 They continued upward towards the Middleham Gallops where several horses were seen being exercised, before dropping down to pass the castle and onwards to meet the River Cover by the stepping stones. The remaining half mile to arrive at the Coverbridge Inn at 12-30, followed the river where much of the footpath was dangerously eroded. Paul, with recently repaired knee, awaited their arrival having secured a large table for the thirsty and hungry walkers. The walkers finally departed the Coverbridge Inn around 3pm to complete the last few miles in the fading light. 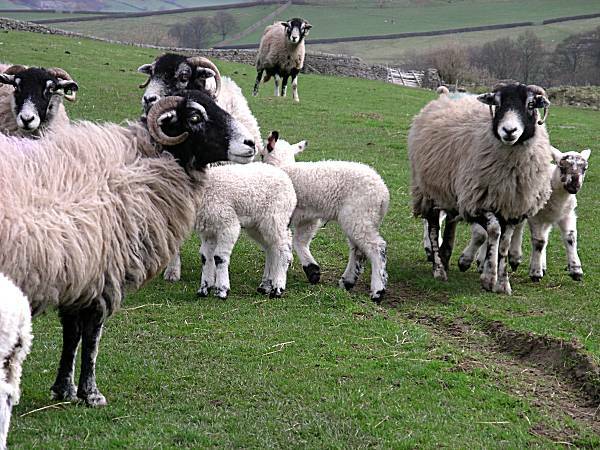 The walkers were horrified to see that a sheep on the opposite bank had fallen into the river and was too tired and cold to climb out without assistance. The compassionate walkers immediately despatched a rescue party, but the sheep fearing for its life summoned extra strength and succeeded to climb to safety, much to the relief of the walkers. 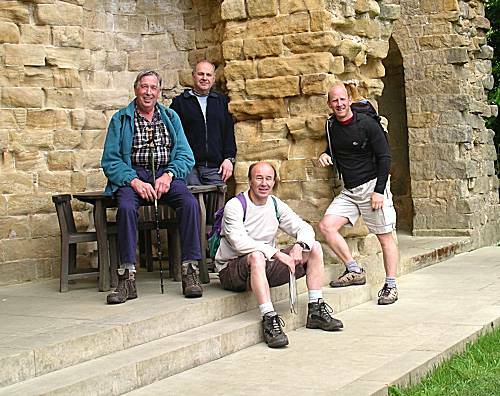 The remainder of the walk was completed without incident, where all agreed that this was a very successful end to the 2008 walking diary. Walkers: Ron, Neil, Alan, Sean, Brad, Cliff and Andy. 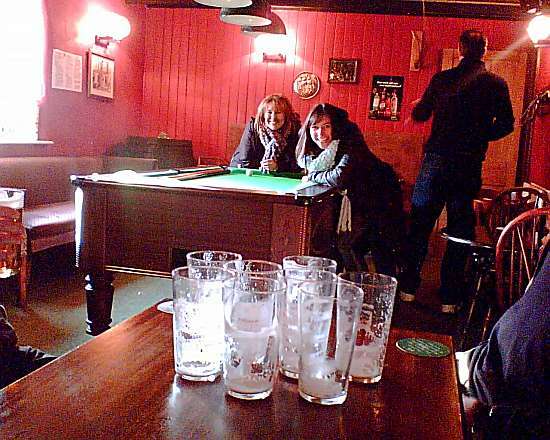 Guest appearance by Paul at the Coverbridge Inn.